Transform the way you plan, manage and report your procurement savings. Now it's easy to manage your procurement savings. An instant dashboard of all your cost reduction activity. Managing your cost reduction projects and reporting the benefits being delivered by them can be a complex process. That's why we developed our Savings Tracker. Cloud-based and simple to use, you can manage your savings pipeline from idea through to realisation, adding visibility and credibility, enhancing your relationships with stakeholders, increasing control of your process, and encouraging new ideas. Find out why over 4,000 procurement professionals across 6 continents are using our Savings Tracker to manage their cost reduction activity. It all adds up to better procurement. Use the intuitive interface to enter your ideas into the cloud-based Tracker and create a savings pipeline. Apply success probability factors to your forecast. Turn those ideas into projects and enter the timelines. Update these in the Tracker from any PC, laptop, Mac or tablet. Use the information to help your budgeting process. Use the Tracker to keep on top of your projects, assign tasks, view Gantt charts, measure any slippage, monitor milestones and communicate to your stakeholders. Using the workflow capability of the Tracker, obtain fully traceable approval within the tool at key project points, including sign-off of realised savings if you wish. Use the fully configurable reporting functionality to track savings in detail across your organisation, including by category, site, programme, savings type and project status. Reporting savings is an ongoing process. As the Tracker is cloud-based, subscription includes support, maintenance and upgrades, ensuring you remain at the cutting edge. Let us show you how the Savings Tracker can makes these 6 steps easy. Arrange a DEMO with us today. If you like what you see, we can provide you with a free no-obligation 30 day trial. The Tracker is for any organisation that wants to measure benefit, whether that's procurement savings, revenue growth, or margin improvement. It handles direct and indirect spend as well as non-procurement areas. We've put a lot of effort into making it really simple to input information and yet its flexibility enables it to cope with the hugely varying demands of different organisations, with a large array of configurable options including savings types, project statuses, approval types and custom fields. In addition you can upload your spend category hierarchy and organisation structure. You can even re-brand the Tracker with your company logo and colour. We have users across the world, and our customers range from FTSE 100, Fortune 500 & ASX 100 companies with hundreds of users running thousands of projects each year, through to smaller organisations with a handful of users. The one thing they have in common is a desire to manage their cost reduction process in an efficient, transparent and credible way. So whether you want to utilise all the functionality of the Tracker, or just a small part of it, or whether you want the Tracker to form the bedrock of your procurement activity for the next few years or just want it to manage a specific cost reduction programme, we would be delighted to hear from you. The Tracker does so much more than just track savings. 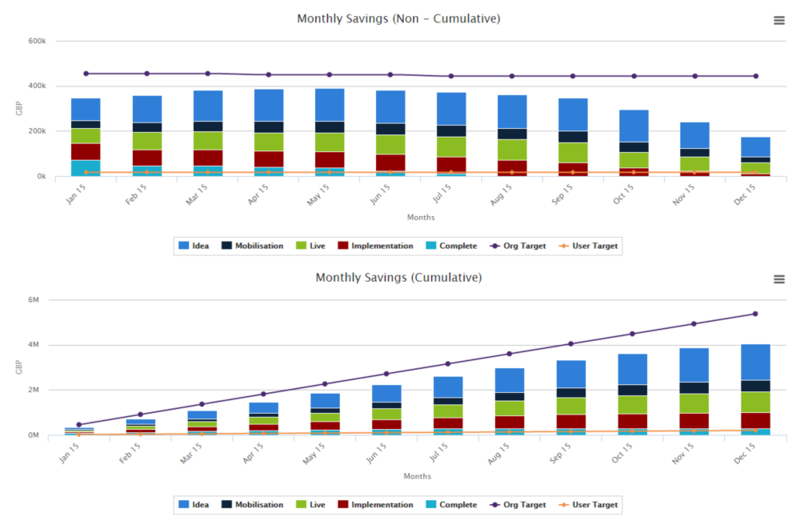 It's really a dashboard of your past, present and future cost reduction activity. The best way to understand what it can do is to see it for yourself. You can do this either via a quick DEMO (which we could give you via the web), or alternatively just give us a CALL, we'd be more than happy to chat. If you like the look of the Tracker we'd be willing to set you up with a free 30 day trial.